Choosing a facial cleanser doesn't have to be so hard, but sometimes we just need a little guidance. As an esthetician who uses a variety of cleansers on many people with different skin type/condition combos, I am happy to give you a little direction before your next purchase. First, let me say you do not need a crazy expensive facial cleanser by any means. You just need one that suits your skin type and conditions. I highly recommend choosing one that you enjoy using, so that you can create a nice self-love and self-care ritual that you look forward to every day. There are a few things to factor into your purchase choice. Some of these will be determined by whether you have problematic skin or not. -Do you want a different cleanser for morning and night? As in one for the shower and one for over the sink? -Do you want one that serves as a makeup remover also? -How about a creamy wipe off one or foamy rinse off? In my experience, I have used Rose Facial Wash on more clients and myself than any other NYR cleanser. It's just a perfect match for normal, combination, dehydrated and sensitive skin. I keep this one in my shower at home. The NYR rose products are so LOVELY. Before I met NYR Products you would not have heard me talking nice about anything rose. I am very sensitive to floral scents. Once you experience REAL rose ingredients in skincare and not gaggy and toxic artifical fragrance, you will understand what I am saying. Next runner up is the very creamy Calendula Cleanser. This one is suitable for mature, dry and sensitive skin, but I love using it as a nice oil based first cleanse on many clients except problematic acne skin. It has cocoa butter, coconut, olive , jojoba and sunflower oils. I apply it on dry skin, massage well and then wipe with a nice steam towel. For home use it can be used as a daily cleanser, make-up and eye make-up remover. I do like the Frankincense Refining Cleanser for a night-time routine. It has a similiar creamy consistency as the calendula cleanser, but has the benefits of firming and toning from the frankincense and peptides. This cleanser also comes with a muslin cloth to be used to wipe away the product to create a smoothing effect. Great for dry, mature and normal skin. I wouldn't recommend it for sensitive because of the peptides or acne prone because of the cocoa butter. The Orange Flower Facial Wash is another good choice for dry skin even though I have been known to use it myself when I run out of the Rose Facial wash. My daughter with super sensitive skin is currently using this one for the winter months because she is more dry. Its a gentle foaming lotion type cleanser. If you are looking for a calming cleanser for sensitive types, the Soothing Starflower Cleansing Milk is perfect. It is formulated without any essential oils to be as mild as possible. The Palmarosa Facial Wash is great for those that have oily, combination or congested skin. It smells very fresh and herbally. I do not use a separate eye-makeup remover in my treatment room or at home because I just use the facial cleansers or oils that can be applied on the eyes. I am a minimalist when it comes to my own routine. I know many people that use and love the Organic Eye Makeup Remover and I have tried it just for the sake of trying it and it was nice and effective. I feel very comfortable suggesting NYR products because they are organic and safe. They are certified by Cruelty Free International. Most of their items are vegan, fair-trade and dermatologically tested. If you need help choosing an NYR Organic cleanser, just contact me I am happy to help. One thing that has recently created problems for me is jaw discomfort. I know I clench frequently and my body seems tense all of the time. Not too long ago the pain was so severe that it was going into my ear. At one point, I went to the ENT doctor because I thought it was something wrong with my ear. Once I started using this remedy, I was able to break through the tension and get my jaw relaxed. Now, if I even feel the slightest tension starting I hop on my self-care ritual right away so I can nip it in the bud quickly. I have been able to help clients and customers that were having severe jaw discomfort by sharing this with them. After that, I decided I should keep the info handy for those who might be experiencing the same thing. 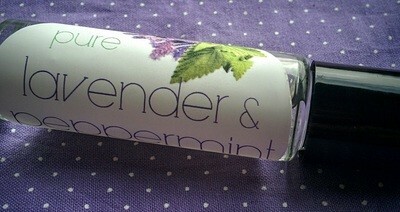 First I use a blend of essential oils that are known to be muscle soothing and tension taming. Lavender and peppermint essential oils are great to have on hand for a wide range of wellness needs and can be used in so many other ways in your daily life. I personally make this blend diluted in a “short term” usage percentage of 3% in a jojoba oil (for ages 12 and up). I like to use a roller bottle to apply this blend down my jawline and down my neck from under my ear. It is skin safe and ready to use. Herbal heat therapy pillows are AMAZING and I have been making them since 2005, before I became an esthetician. It all started by making a few for gifts, but the demand was incredible and it turned into a mini business because people wanted them! I couldn’t even keep up with the sewing at one point and had to hire my good friend and sewing extraordinaire VickiG to help me. You have probably seen them before, it’s not something unique and they are sold many places. It took me many years to perfect the size and style that worked well for me and my customers, but the fact that they really help calm, soothe and relax the body is not even in question. Anyway, this one size pillow 6″ x 12 ” filled generously with flax seeds, lavender buds and peppermint leaves is my personal favorite. I sleep with it every night, it’s like a warm hug on my body and to help take the chill from a cold bed so I can relax and get to sleep easier. This pillow is thick and squishy, perfect for placing on the jaw to help relax those muscles in that area. You can definitely use the pillow without the essential oil blend, but the two together work like a dream. Facial massage techniques have a lot of power behind them and one is the ability to relax the jaw muscles. Whether you are doing it at home or you are getting a service from an esthetician or a massage therapist, a facial massage is AMAZING. I love to use awesome massage tools like the Kansa Wand and gemstone rollers in my services and on myself at home. Jaw tension can also cause or increase dull skin, acne and puffiness because it restricts blood and lymphatic flow. The lymph fluid cannot drain and the cellular waste will sit stagnant increasing the toxins. If you suffer from a tense jaw I would highly recommend you try one or all of these suggestions. They are simple and inexpensive ideas to get relief and practice self-care.